Planning a wedding in Newcastle? Then look no further! North East Wedding Band Funk Conspiracy are here to tell you all about the city of Newcastle. Ease some of your wedding woes by using this page as a guide to the finest Newcastle wedding venues, hotels and restaurants. Book Funk Conspiracy as your Newcastle wedding band, because we provide a professional and reliable service that will turn your special day into a dream come true. Use our definitive Newcastle wedding guide to ensure everything falls into place! 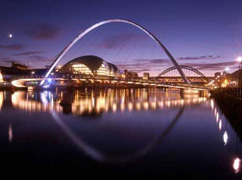 Situated in the North of the UK, Newcastle upon Tyne is England’s most northerly city. Newcastle is an ideal wedding location because of the excellent transport links in and out of the city. A 20 minute metro ride from the centre of town will take you to Newcastle’s International airport – absolutely brilliant if your Newcastle wedding involves guests travelling from abroad. Famous for its ship building industry, Newcastle is situated by the River Tyne. The town centre itself boasts many gorgeous buildings, many of which are ideal Newcastle wedding venues, so it is an ideal place to host your fairytale wedding. Tourists visiting Newcastle have a wealth of scenery and attractions to enjoy. Also famous for its shopping area, there’s something for everyone in Newcastle. There are many museums in Newcastle which depict the fascinating history of the area, including The Discovery Museum, The Great North Museum, and the The Centre for Life. 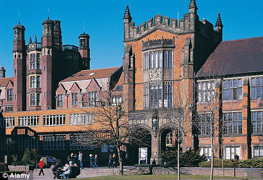 Newcastle is also home to two large universities, Newcastle University is a redbrick university and also the more modern, Northumbria University, both of which are situated in the city centre. Newcastle boasts plenty of beautiful wedding venues, from smaller, intimate venues for a low key wedding, to larger and grander halls for a bigger wedding. Located centrally on the south bank of the River Tyne in Gateshead, take a look at The Baltic - the biggest gallery of its kind in the world. It is actually an old flour mill and is now host to art exhibitions, and is a popular Newcastle wedding venue. 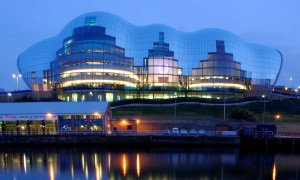 Next door to The Baltic is the iconic Sage Gateshead, a purpose-built music and arts centre. There are 3 popular hotels all situated within a stone’s throw of Newcastle Central Station, in the city centre. The Thistle County Hotel has two air-conditioned function rooms, both of which can be arranged and configured to suit your exact requirements. The larger of the two is the Mozart Suite, with opulent oak-panels and original ceilings soaring 14 feet above you, with sparkling crystal chandeliers and high windows looking out over Newcastle Central station. The newly-refurbished County Suite, has a high vaulted ceiling and original stained-glass windows, is licensed for civil ceremonies with up to 80 guests, and like the Mozart Suite, it has its own private bar. The Vermont Hotel has 3 stunning rooms, The Heritage Suite, the Rooftop Terrace or the Blue Room Restaurant. They accommodate every kind of celebration, from marriage ceremonies to glittering champagne receptions. The Copthorne Hotel is a 4 star hotel situated on Newcastle’s Quayside. There are plenty of suites to choose from, with most having splendid views of the River Tyne. Situated about 10 minutes drive from Newcastle City centre, Jesmond is a beautiful residential area with some stunning wedding venues. 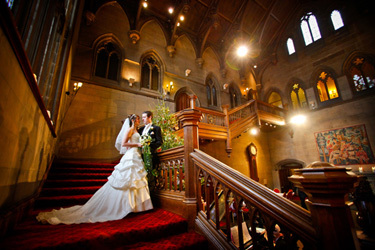 Choose from Jesmond Dene House Hotel located in the beautiful Jesmond Dene, with a mixture of grand or intimate rooms in which to marry and celebrate. As You Like It is host to Jesmond’s largest function room, The Frangipani. They specialise in weddings of all sizes and have a license to hold ceremonies too. The Mansion House is the official residence of the Lord Mayor of Newcastle upon Tyne. The beauty of this historic home is that there are so many different possibilities and it doesn’t matter if you’re planning an intimate affair for a small number of people or a lavish wedding – they have the venue to suit. Located in the Northern suburbs of Newcastle, Gosforth is an affluent area and has some unique venues for your Newcastle wedding. Gosforth Civic Hall is a versatile venue with excellent services and utilities. Gosforth Civic Hall has a main room and a reception room with natural daylight and can accommodate up to 200 guests. The Marriott Hotel Gosforth is set on 12 acres of parkland, offering a scenic and tranquil environment for your wedding. Their largest room can accommodate up to 750 guests for wedding receptions. The venue also specializes in ethnic and Asian weddings and allows outside catering. Celebrate your wedding in the unforgettable and truly unique Newcastle Racecourse where weddings can be celebrated all year round. Choose your special day with the peace and tranquility of High Gosforth Park, or the exciting atmosphere of a raceday. Gibside is a National Trust site and has a taste of the country on the edge of the city in a stunning 18th century landscape garden and nature haven. With the ability to prepare dishes of your choice by prior arrangement, and a beautiful Palladian chapel for your ceremony, Gibside has everything you could wish for for a fairytale wedding. Located within a few miles drive of each other, Dissington Hall, Kirkley Hall and Horton Grange are in the North west area of Newcastle bordering Northumberland. These venues are all in close proximity to Newcastle International Airport. Dissington Hall is a superb wedding venue set in beautiful private grounds. It’s calm and classical surroundings are a magnificent Georgian estate, and you have exclusive use of the Hall and its beautiful grounds, with the option to use a heated marquee. Set in beautiful grounds and gardens and offering a tranquil location for weddings, Kirkley Hall is a 17th Century Grade II listed building. Horton Grange is another Grade II listed building where your dream wedding may include the beautiful garden gazebo. Travelling west from central Newcastle, North of the River Tyne, you’ll find Close House, High House Farm Brewery and Matfen Hall. Close House is a privately owned luxury hotel and golf club, and is set in its own glorious parkland and landscaped gardens that sweep down to the banks of the River Tyne - perfect for a traditional Newcastle wedding. The High House Farm Brewery in Matfen is a 200 acre working farm in a Grade II listed building, situated half a mile from the historic Hadrian’s Wall with rolling fields, streams and woodland. It’s a unique and lovely wedding venue that is very popular, as are it’s ales! Matfen Hall is a Golf and Spa Hotel that is situated in the charming village of Matfen. This stately home is set in 300 acres of parkland and boasts an award winning restaurant. If you fancy a classy evening out, head to Mal Maison, a boutique hotel and restaurant. Situated on Newcastle’s Quayside it has fantastic views across the River Tyne and complemented by its stylish interior, really has a refined ambience. Enjoy cocktails, incredible drinks, glamorous people, try a selection of iconic dishes in the Brasserie and why not take a look around and consider it as your Newcastle wedding venue? If you fancy trying out some Celebrity Chef dining in the heart of Newcastle, head to Hotel Indigo, home to the Marco Pierre White Steakhouse Bar & Grill. Offering what Marco himself describes as 'affordable glamour', this award winning restaurant offers diners world-class food in an environment that is fun and informal. If you fancy high quality, authentic Italian dining, book a table at Adriano’s. This Italian restaurant in Gosforth’s High Street is well worth a visit. You’ll find it’s warm, inviting atmosphere complements the fantastic food on offer. 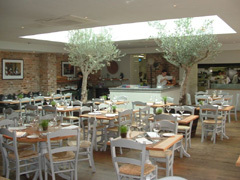 Adriano’s is a firm favourite with Funk Conspiracy, dining in a beautiful setting amongst olive trees is just divine, and what’s more, lunch deals mean it’s affordable too. The Funk Conspiracy Newcastle wedding guide was written by Navella Caretto.